This summer I was out on the lake helping Cam McCauley, a marine biologist with the Ontario Ministry of Natural Resources, and Steve, a skilled MNR technician, measure the temperature and concentration of oxygen, meter by meter, in three of the deep “holes” or “trenches” in Buck Lake inhabited by lake trout. When we pulled up the anchor from the second of those “holes” on the South Branch, with it came a long length of steel fishing line at the end of which was a famous fishing lure invented and manufactured right here on Buck and Devil Lakes. Cam and Steve recognized it immediately. It was a Johnnie Green spoon! The Greens were among the earliest families to settle here. According to Archie Green they came as United Empire Loyalists just after the American Revolution to claim Crown Land on Buck Lake. There Archie’s father, Johnnie Green, was born, and raised. He married Laura Whalen and raised a family of 10, six boys (one of whom was Archie) and four girls. 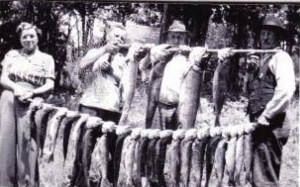 Around 1927 the family moved from Buck to Devil Lake where Johnnie continued to farm, hunt, trap, and do whatever he could to make a living including work in the summers as a guide, primarily for American tourists keen on fishing, especially for lake trout. 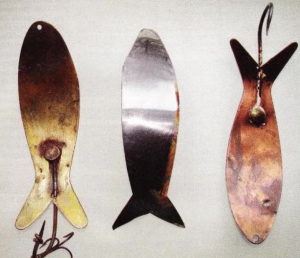 According to Harold Green, another of his sons, in 1933 Johnnie started to make a lure that looked like a herring, a bait fish commonly used by those fishing for lake trout or salmon, as they are often called. Apparently he made the first ones out of the chrome plate used in the headlights of old model T Ford cars, a metal that was pliable, reflective, and quite readily available at the time. Later, he adapted his craft to copper and a variety of other metals as well. The Johnnie Green spoon is a “wobbler”; it has a distinctive action given to it by the particular bend or curve put in the body of the lure by its maker. It has a hole drilled in the front for attaching the fishing line and trails either a single hook or a treble gang hook. Most but not all have a punched-out “eye” but all are characterized by being highly polished; the experienced fisherman will polish his or her Johnnie Green spoon with steel wool and carefully check its action at the surface before setting out to troll the deep water in which lake trout are normally found. By 1945 Johnnie Green’s fame as a guide and lure-maker had grown to the point that he built some cabins on Devil Lake to accommodate the tourists who came to fish with him. One photograph shows a total of 24 lake trout, 4 of them huge, caught by a party of Americans, presumably after a routine day of fishing – out by 8 am in a 14 to19 foot rowing skiff and back by 6 pm interrupted by a “shore dinner” of sandwiches and fried fish at noon. He made his spoons in the wintertime and sold them, according to Harold Green, “for 50 cents at the start and never over $2”. Apparently the winter’s production would total 10 or 12 boxes of lures, a dozen to a box, separated by tissue paper – not much for a winter’s work even in those days when a dollar was real money. Johnnie also built skiffs out of cedar in the winter months and hollowed out dugouts with an adze from butternut or basswood logs. John MacComish claims that his father, Wallace, had said that those dugouts were “so tippy you had better keep your tongue in the middle of your mouth” when paddling one. Although the Johnnie Green spoon has been made for some years by a number of companies, attempts to patent its design and commercialize it came for naught during Johnnie Green’s lifetime. According to Harold Green, somebody from Kingston once contracted with Johnnie to make lures for a “cut” of the profit on those sold but “Dad lost a pile of money on that deal”. There is also a story about his giving an American entrepreneur a pattern for the spoon to which his name would be attached once patented in return for the payment of $500. But no commercially manufactured spoons from that period carry the name of Johnnie Green and no American patent of the design has been confirmed. Archie Green reported that his Dad was upset and angry that others did copy and manufacture his spoons. It remains that this spoon is highly sought after. It can still be bought in outlets up and down The Old Perth Road, an area known by those who fish for lake trout as “Johnnie Green Country”. As quoted by Gary Peck. 2006. Canadian Fishing Tackle, #5, 1-18, a copy of which was provided to me by Bill Ritchie in 2007. Another was Alfie, two of whose sons, Ronald and Elmer Green, still live on Buck Lake. Provided to me by John MacComish in 2009.